I first met Tasmanian born Indigenous boxer Daniel Geale at a small amateur fight show in Canberra. While he was the star attraction of the night, pausing endless times from his meal to sign autographs in the ten minutes he had to squeeze in a bite to eat, he never failed to smile. But unlike many other elite sportsman who turn up to smaller events to ensure they are seen, Geale was there for the sport. He was cornering (Coaching) young kids, some in their first fight. Some would win, some would lose, but all there that night benefited from having the IBF Middleweight Champion of the World there to share some advice, take a photo and remind all that the very best never forget where they come from. In 2002 Geale won the Gold medal at the Manchester Commonwealth Games in the welterweight division. Since then he has had a remarkable professional career winning the OPBP & IBF Pan Pacific titles and the IBO & IBF Middleweight titles. Unlike some of his contemporaries Geale never dodges a fight, always gives back to the fans and in what can be a controversial sport is nothing but a gentleman. Now one more time on home shores before a switch to the bright lights of Las Vegas Geale will put his belt on the line in front of his home crowd. “Grange Global Promotions in conjunction with Main Event Television and Gary Shaw Productions present a feast of world class boxing Wednesday, March 7th 2012 at the Derwent Entertainment Centre, Hobart, Tasmania. In his last bout on home soil before heading abroad, International Boxing Federation world Middleweight champion Daniel “The Real Deal” Geale faces his toughest test to date when he defends his crown against the number one contender Osumanu Adama of the United States. With a quality undercard commencing at 6.00pm, get in early for your tickets to this must-see world title showdown, on sale as of 9.00 am Monday 23st January 2012 starting at $45 through Ticketmaster.com, by calling 136 100 or attending the D.E.C. in person. MAIN EVENT will also broadcast every minute of the entire card live and exclusive to FOXTEL, Austar and Optus terrestrial subscribers as well as to selected FOX SPORTS pubs and clubs. Deep in the North of Brazil along the Xingu river, a tributary of the mighty Amazon, live the Kamayurá an Indigenous tribe of the Amazonian Basin. Like so many Indigenous peoples around the world they had been nearly wiped out after their lands had been “discovered”. A measles epidemic brought to their area by a rapidly expanding Brazilian population reduced their numbers in the 1950’s to just 94 people. But like many Indigenous peoples around the world they are showing while they may have had their backs against the wall, they will always fight back and their population has doubled in just the last 8 years to be now 600 strong. A fighting spirit is something deeply connected to who they are and they have practiced the ancient art of Uka Uka (traditional wrestling) for longer than modern history can recall. So when UFC Middleweight Champion and undisputed P4P king of Mixed Martial Arts Andreson “The Spider” Silva had a opporunity to visit his countrymen and learn an art form he jumped at the chance. Yellow rope in Capoeira and training boxing with Pacquiao trainer Freddie Roach he ventured into the Jungle of his home land to learn Uka Uka from the Indigenous Kamayurá people. As he says, to be the best the mind must always be open to new things, new experiences and sometimes the best new thing is something that has been around for centuries. So is this not yet another example of what we as greater Australia are missing out on? Imagine how many thousands of old tricks we could be taught by the Indigenous peoples of Australia if we had the same humble heart and open mind as the greatest fighter on the planet! Fairfax’s Martin Flanagan reports on the continued success and exceptional TV talent that is the Marngrook Footy Show. THE week Melbourne lost by 186 points to Geelong and coach Dean Bailey got the sack I watched the Marngrook Footy Show. The prevailing tone of the footy media that week was running at the same pitch it does when a natural disaster like a cyclone hits. A tidal wave of rumour and speculation about the Demons’ inner politics swamped the footy world so that even someone like Garry Lyon, who was supposedly at the centre of events, admitted he didn’t know which stories were true and which weren’t. It was one of the high points of the season in terms of footy as a media game. So what struck me when I tuned into the Marngrook Footy Show that week was that the show didn’t start with Melbourne. It bounced straight into the teams for the next round, the ins and outs, who was going to win and why. It was like watching an old 1960s footy show, the difference being that this show is indigenous. What makes it even more interesting is that more and more non-indigenous people are watching it. The host, and the brains behind the show, is Grant Hansen. A western suburbs boy, he played under-19s for Footscray before playing with local clubs like St Albans. A professional musician, he has served on numerous boards of indigenous arts and media organisations. Sixteen years ago, motivated by the fact that there were no former indigenous players in the footy media, he started a radio show called the Marngrook Footy Show. It just keeps growing. Hansen says the TV version of the Marngrook Footy Show, aired nationally each Thursday night on ABC2 and NITV, now plays to 300,000-400,000 viewers. A lot of the show’s appeal lies in its panel. Gilbert McAdam is an Aboriginal Lou Richards. He gets up from the bottom of every pack with a quip. His relationship with the English language is unusual and entirely his own. Listening to him speak can be like watching a frog leap backwards – his sentences start where they end and end where they start but the one sure thing is that Gilbert enjoys himself. He’s like a man driving a tractor the wrong way up the Hume Highway waving to all the cars. Then there’s Rocking Ronnie Burns who looks and sounds like a slick, rough-voiced character in a Martin Scorsese film about America in the 1920s. Ronnie is a Tiwi Islander with a near permanent grin on one side of his face. The late Bob Davis immortally said of Ronnie’s time at Geelong that he was “good until they taught him how to play”. Ronnie was a smart player, as was Gilbert, who was among St Kilda’s best in one of the best finals I’ve seen – St Kilda v Geelong, 1991. Usually Chris Johnson is on. In my book, Johnson’s a champion in that he made a complete product of his footballing talents. Back pocket in one of the best teams of all time (Brisbane Lions 2001-2003), he’s a three-time premiership player who was twice All-Australian. Johnson has a natural authority and I hope he coaches at AFL level. He was also the last Fitzroy player in the AFL, which is fitting given that a lot of older Victorian Kooris like Archie Roach and Uncle Banjo Clarke barracked for Fitzroy because that, once upon a time, was where Kooris lived in Melbourne. The final member of the panel, Alan Thorpe, played with four AFL clubs – Fitzroy, Footscray, Sydney and Carlton – and too many other clubs for him to remember. He is known on the panel as the Journeyman. However, Thorpe’s roundabout path through life has made him a man of depth. He does a lot of work in the Koori community, organising events like men’s groups. What’s clever about the show is that it’s made with children in mind. Nothing is said or done which questions its family show status. It’s good-natured, it’s fun and guests are lining up to appear on it. Fremantle coach Mark Harvey took over the program the night he was on, as did that true original, Rex Hunt. A notion of respect underpins the show so that when people who really know the game speak – like Mark Maclure and Wayne Carey on Thursday night – people listen. The program also showcases live Australian music. It has two women presenters, primary school teacher Shelley Ware and the evocatively named Leila Gurruwiwi. What strikes me about Leila, who comes originally from Arnhem Land, is how confident she is. In fact, what strikes me about the Marngrook Footy Show is how confident it is. Anyone making generalisations about indigenous culture in this country that neglected to mention the Marngrook Footy Show would be missing something significant. The show is edging its way into the mainstream media, which is exactly where Grant Hansen wants to take it. In Defense of Mia Freedman… and Cadel! After three weeks of a 2am bedtimes I was a little slow to catch the hysteria that whipped up after Mia Freedman appeared on the today show and had this reaction to Cadel Evans winning the Tour de France. “I’m the opposite of fired up. I’m fired down. I just don’t care.”. “The way Australian sportspeople are revered as heroes and worshipped above every other profession.”. Well that and a few other comments by Freedman shared with Karl Stefanovic on the Today Show had people going out of their minds. So much so they bombarded Freedman’s Twitter and email with abusive messages and claims that she was un-Australian. Well knock me over with a Lamington and call me Bob Downe but as someone who watched every televised second of the Tour I was not in any way offended or annoyed by Freedman’s comments. She doesn’t share my love of the three weeks in France and sport in general. So where I get joy from watching my beloved Hawthorn Hawks winning flags, I am guessing she gets her kicks from the launch of the latest Jimmy Choo’s. That doesn’t make me or her un-Australian. If Freedman had said she couldn’t get excited about Buddy bending one back from 50 out after running the wing with a couple of bounces I wouldn’t be so offended that I’d go out of my way to personally abuse and insult her. That is un-Australian! What followed Freedman’s comments was the usual exaggerated outrage, head shaking and angry outburst and then the aforementioned abuse that went her way. There was also the unsavoury d@#k measuring where many reeled off their list of sporting achievements in the suburban park which then some how justified their attacks. Well not one to be left out let me flop mine out on the table and see how I measure up. Sport, I love it. I have played most sports you can name, played rep. Cricket, Basketball, Soccer and a whole host of other sports. I’ve managed Australian champion boxers, attended everything from Boxing Day test matches to Para-Olympics, written for Motorsport magazines, punted a fair chunk on the dish lickers and watch more sport on the box in a week than is probably healthy. And still, I am not offended by Freedman’s comments in the slightest possible way. Because the achievement’s of Cadel Evans both on and off the bike can’t be in anyway impacted by a few lines of one social commentator who didn’t even watch Evans compete. Perhaps Freedman’s biggest error was to pick the one sportsman who is virtually flawless from what any of us can tell. He is a cyclist whose sheer mental strength and determination propels him above and beyond those who are seemingly more naturally talented. In a sport littered with drug abusers he is bleach white clean and if winning wasn’t enough he supports freedom for Tibet, “Trying to bring awareness of the Tibet movement is something someone in my position can do.” Not only that the list of charities and good causes he has donated to are endless and he is married a beautiful and brilliant Italian. I rank Cadel’s win in the Tour second only to Cathy Freeman’s win at the Sydney Olympics in terms of Australian sporting achievement. Both left me feeling something I cannot describe but the sort of joy that has you jumping around the living room floating with pride and elation. In a sports mad nation that loves an underdog and the never say die attitude Cadel Evans is pretty close to Jesus Christ in Lycra. And anyone who has attacked Jesus in the USA publically probably knows how Mia is feeling right about now. But is that ok? Of course not, we are not Iran with a bunch of Ayatollahs telling us who we can and cannot be angry at. We don’t kill people for drawing cartoons and we are meant to allow freedom of speech and welcome diversity of opinion. That includes people saying things we don’t agree with. Mia also raises a very pertinent point, Sports people really do earn too much money. There are football players (soccer to those who didn’t listen to Johnny Warren) who with endorsements earn a million bucks a week. And there are many actors, singers and “entertainers” earning similar amounts. That is obscene when we are still paying nurses, teachers, disability carers, soldiers and a whole host of other folks minimum wage. Mia Freedman simply made some valid points, expressed that she wasn’t that into sport and for having her own opinion was attacked. And it was only a few weeks ago that the mortified Karl Stefanovic made ignorant and offensive comments about an Australian who is an 8 time World Champion. Mia Freedman didn’t attack Cadel Evans, she didn’t know enough about him to do that. What she attacked is the idea and a reality, that sports people do in fact earn a lot more than those on the front line of saving lives. But all that was lost in a level of behaviour we really should not tolerate in a modern Australia. 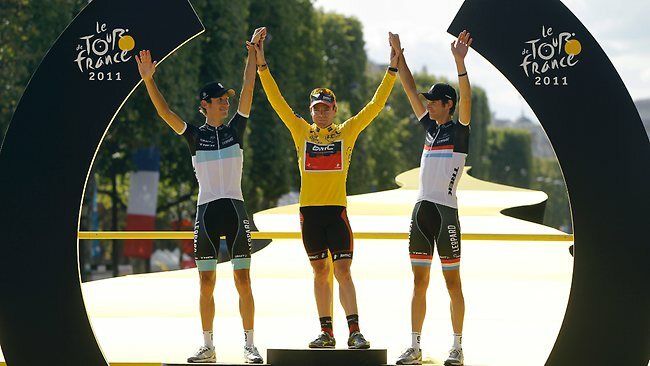 And certainly not the sort of chest beating and abuse you would never see from Cadel Evans. How does he handle those on the other side? He grits his teeth, looks them in the eye and then rides right past them. And then when all is said and done he gives them a hug on the podium. That is an Australian that makes me proud! Bradman’s handling of the issue of whether to ban the all-white South African Test cricket team from touring Australia in 1971-72 was his most important legacy. Bradman was anti-apartheid, yet believed South African cricketers were exempt because they had shown their opposition to racism. Accompanied by the South African ambassador, Bradman witnessed 1971’s Australia-South Africa rugby Test in Sydney. He abhorred the violence of protesters, who invaded the field, and left with concerns that a cricket match would be hard to police, and that cricket would be worse for it. But in his last year as chairman of the Australian Cricket Board, Bradman stood firm. The cricket tour was still on. He told Rivett the rugby team “comprised mainly of [apartheid-supporting] Afrikaners”, while white cricketers were “basically of English descent” and supported a political party not opposed to mixed sport. “Politics should not come into sport,” he concluded. This placed Bradman with 75 per cent of Australians. But Bradman had a flexible mind, and decided to explore the issue himself. He wrote to the anti-apartheid protest movement in Australia, asking them to explain the demonstrating. Meredith Burgmann was astonished to receive such a request from someone she regarded as typically, trenchantly Establishment. Vorster’s racist attitudes – Bradman thought them “ignorant and repugnant” – contributed to his change of mind, which had been precipitated by Burgmann and Rivett. Bradman flew to Britain to meet Harold Wilson and Ted Heath, British political leaders who had dealt with the protest problem in England. Bradman returned to Australia with his mind made up. He reached agreement with Cricket Board fellow members, called a media conference and announced the tour’s cancellation. Bradman made a simple one-line statement: “We will not play them [South Africa] until they choose a team on a non-racist basis.” In South Africa, Vorster vented his anger publicly against Bradman while the African National Congress rejoiced. In response to Rivett’s congratulations, Bradman wrote: “I appreciate the compliments but, no offence meant, I’m not really in the mood to feel elated. I’ve seen too many sides of the issue, the good and bad of each. I was not cut out to be a politician or banner-carrier. Bradman knew he had ruined the Test careers of some of the finest cricketers, including Barry Richards, Hylton Ackerman and Graeme and Peter Pollock. South Africa’s team had been dominant, but now was in tatters and would have to disband. Bradman’s no-tour decision put the Australian Cricket Board in a hole financially, and Bradman invited a magnificent multiracial combination, led by Sobers and including Ackerman and the Pollock brothers, to play against Ian Chappell’s young Australian team. The tour was a financial success. On the bigger issue, Bradman succeeded where politicians and protesters failed because he went beyond entrenched arguments to uncover the integrity of the matter. His reputation and fame meant the unexpected move was a massive international blow to apartheid. In April 1986, a Commonwealth group of seven “eminent persons”, including Malcolm Fraser, visited the imprisoned Nelson Mandela, whose commanding presence belied his 24 years of incarceration. His first question was, “Is Don Bradman still alive?” Bradman had been Mandela’s sporting hero, and his 1971 ban-the-tour decision deepened the endearment. In 1993, a South African team, chosen on a non-racist basis, toured Australia. Breaking news! Racism rocks AFL. Western Bulldogs forward Justin Sherman admits he racially vilified a Gold Coast Suns opponent in AFL. Sherman and his unidentified victim have been part of a conciliation meeting and settled on today. Former Brisbane Lion Sherman admitted he racially vilified an opposition player and apologised, AFL football operations manager Adrian Anderson said. Sherman will attend an education program, serve a four-match suspension to cover rounds 15-18 and make a donation of $5000 to the charity nominated by the Suns. Anderson said no person involved in the conciliation agreement, the AFL, Western Bulldogs or Gold Coast may publicly identify the Suns player involved. While we are now aware of the name of the player who was racial vilified we will not publish it. Mainstream media outlets have chosen to do so, despite this not being the wish of the victim. So in respecting him we will not follow the lead of the press who do not know when some thing should go unsaid. What would will say is that this young man has handled himself exceptionally well in very trying and difficult circumstances. He agreed to be part of the mediation process and his actions have played a vital role in ensuring this issue is dealt with in the most effective way. The AFL is also to be congratulated for taking swift action, ensuring the fine money will go to charity and protecting the victim. The media could learn a little! Racism, it’s just NOT ok! Aussie selected No.1 in NBA Draft! AUSTRALIAN-born, American-raised basketball prodigy Kyrie Irving was today selected No1 in the NBA draft. The Cleveland Cavaliers, as expected, used their first pick to grab the prized 19-year-old point guard, who was born in Melbourne and played just one year of college basketball at Duke University. “I’m looking forward to getting to Cleveland and it feels good to finally put a hat on,” said the 188cm tall Irving, wearing a Cavaliers’ cap. Irving was born in Melbourne in 1992 while his American father, Drederick, a former star at Boston University, was playing for north east Melbourne club Bulleen Boomers. Irving spent just the first two years of his life in Australia before his family moved back to America, but has dual Australian-US citizenship. A night we were 1 Deadly Nation! For every LeBron James making tens of millions of dollars there are thousands of guys and girls around the world who had hoop dreams. Taurian J. Fontenette is one such man, he never made it to the NBA, he will never be a multi millionaire, but he has a talent for putting on highlight reel dunks wherever he plays. We celebrate all talent, not just the millionaires.